Our selection of women's Barbour International sweaters has been exclusively chosen to offer the best knitwear in the business. Designs draw on the brand’s strong motorcycle heritage and fuse it with a touch of contemporary glamour for pieces that will add an extra stylish touch to your everyday jeans and sweater ensembles. Alongside their style factor, the sweaters provide the exceptional comfort and quality that the brand are renowned for, offering practical styles that are flattering on all shapes and sizes. Crafted from a range of luxurious fabrics such as cashmere, alpaca and viscose, these beautiful Barbour International sweaters feature premium finishes including sequins, cable knits and contrast trims. Available in a range of colours to suit your individual style and taste, the Barbour International knitwear features a wide selection of styles from athletic hoodies to formal sweaters, which vary in thickness to allow you to wear throughout the seasons. Women's Barbour International Helical Knit. 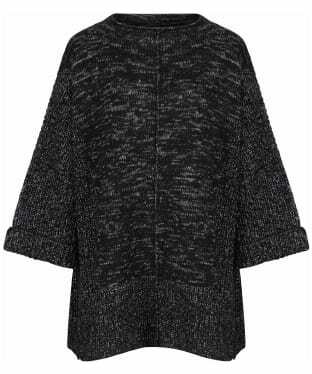 Cape and blanket-like, this twisted yarn knit style is a real seasonal statement piece. 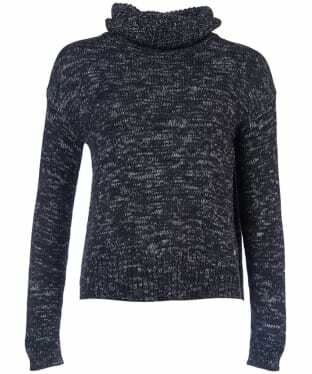 With wide and easy square shape and lofty ribbed sleeve, it is the perfect cosy and stylish knit for winter. A new addition to the Barbour International collection, the Women's Hartle Knitted Sweater boasts an ottoman knit design, combing a stylish two-tone colour blend to keep you looking on-trend through this season and beyond. Perfect for placing under your favourite Barbour International jacket, this fashion forward sweater features an exposed zipped pocket to the sleeve, inspired by the brands motorbike heritage for that iconic feel that you are sure to love. Perfect for adding warmth and style to your look, the Women's Barbour International Losail Knitted Sweater has been crafted from lambswool to keep you cosy and to offer a premium feel. 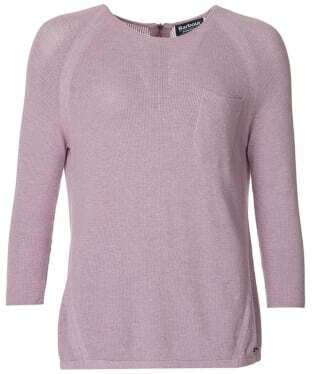 This sweater boasts a wide neck for a feminine, flattering feel and a button down shoulder fasten for that added touch of on-trend detailing. This knit is finished with a ribbed hem and cuffs for a neat fit. The Women's Barbour International Aragan Knitted Sweater is the perfect way to layer up and add warmth to any outfit this season and beyond. 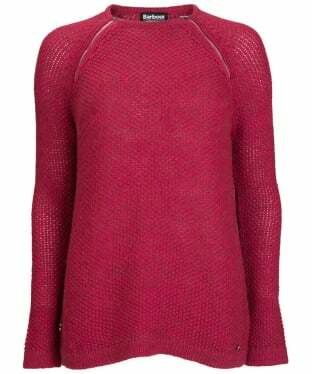 The sweater is long sleeve and features a wide neck for a fashion forward feel you are going to love. Crafted from 100% cotton the Aragan Knit offers a soft comfortable feel all day long, whether you are on a country walk with friends or simply wandering round town. The sweater includes two side entry zip pockets for your personal essentials and is finished with the Barbour International metal ID bar branding to the centre back for that final touch of style and quality. Pair with your favourite Barbour international jeans and jacket for a beautiful casual look. 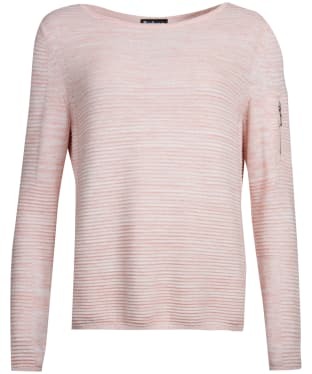 Perfect for adding warmth and style to any outfit, the Women's Barbour International Track Knit features staggered, broken intarsia stripes to the front, along with a wide slash neckline, for a fashion forward feel that you are sure to love! Crafted from 100% cotton, the super soft Track Knit will keep you comfortable all day long, whether you are out in the country walking with friends or wandering around town. 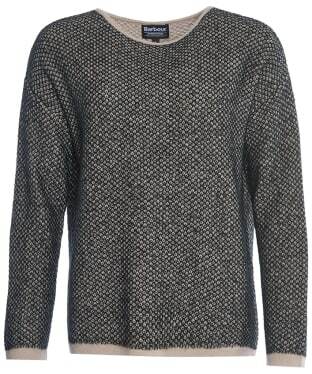 The sweater is finished with Barbour International metal ID bar branding, for an on-trend, quality feel. Pair with your favourite Barbour International jeans and jacket for a beautiful casual look. Perfect for placing under your favourite Barbour International jacket, the Women's Camier Knitted Sweatshirt boasts ripple stitching, inspired by the brands outerwear pieces, for that iconic feel that you are sure to love. 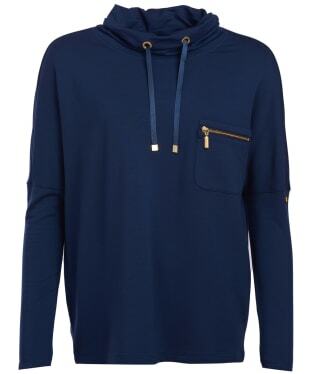 Soft and comfortable, this 100% cotton sweatshirt offers an on-trend look, with side zips to the bottom for that added touch of stylish detailing. Sure to add warmth on those cooler days, the Camier is finished with deep ribbing to the hemline for a feminine, figure flattering fit. Every stylish lady needs the Women's Barbour International Byway Sweatshirt this season, giving a sports-luxe athletic finish to your outfit. The fit is comfortable, skimming the hips delicately, you'll feel great, relaxing at home or out enjoying time with friends when wearing this soft jersey sweatshirt. The Women's Barbour International Byway Sweatshirt is made in a soft jersey, featuring a wide funnel neck, a patch pocket on the chest and the black and yellow lozenge shape logo on the left sleeve; the ideal sweatshirt you'll love to wear this season and beyond. The Barbour International Catlina Knitted Sweater is a relaxed-fit women's sweater, meaning it is sure to flatter all shapes and sizes and offer a fashion-forward look. 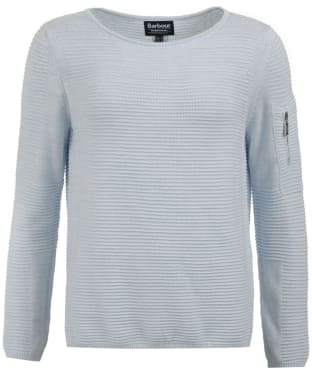 Crafted in pure cotton with a tuck-stitch texture and intarsia colourblock panels to the outer sleeves, this Barbour International sweater is sure to turn heads. 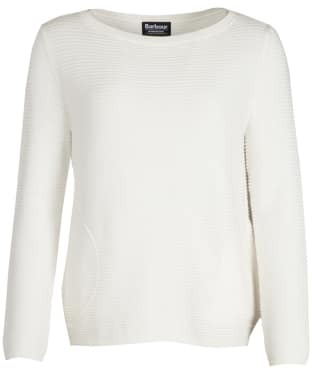 Offering a relaxed fit with a wide scoop neckline and long sleeves, the Catlina sweater will look great with skinny jeans for an effortless everyday style. 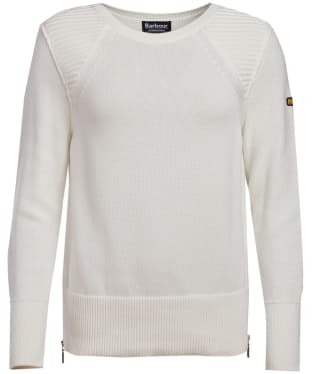 This striking Barbour International Rivco Knit Sweater is a relaxed fit long line sweater with stylish side vents for extra moveability and comfort. 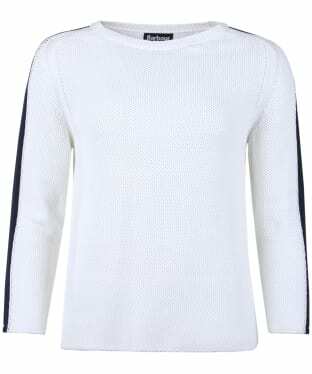 The Rivco Knit features a soft, drop shoulder to offer a stylish and laid back finish to the jumper. 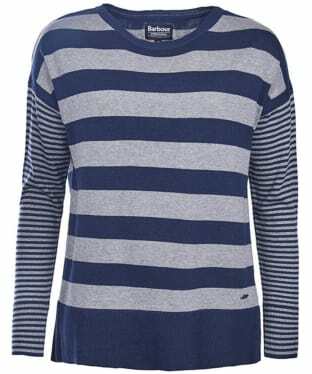 Crafted from 100% cotton, this lightweight knitted sweater features a bold stripe design to the torso, with finer lines to the sleeves for added interest. The Rivco Knit is finished with a simple round neck and a Barbour International ID tag. 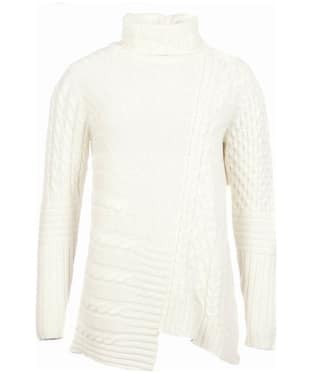 This cosy Barbour International Enduro Knit Jumper is ideal for layering up during the colder months. 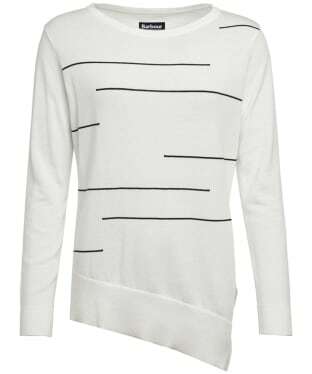 The open knit construction creates a lighter, looser feel, which is complement by the relaxed shape. Ribbed cuffs, hem and neckline ensure a neat fit, while the multi fabric blend, including cashmere, makes it each wear feel comfortable and luxurious. This Barbour International Enduro Knit has been finished with a signature metal brand ID tag just above the hem. Great for wearing with jeans and ankle boots for a casual yet chic weekend look. 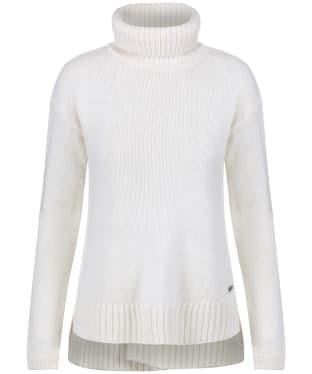 This patchwork style Barbour International Mondello Roll Neck Sweater is an ultra soft and fabulously cosy winter warmer that you are sure to love wearing in the colder months! Featuring a stylish asymmetric hemline and multiple textures throughout the sweater, this naturally warm blend of wool, cashmere, viscose and poly offers a unique yet timeless look that will easily complement any outfit. The Mondello knit is cut to a relaxed fit to offer a casual, comfortable style that is ideal for layering. If you're looking for the perfect lightweight sweater for those funny inbetween weather days, then the Barbour International Suliven Knit is for you. 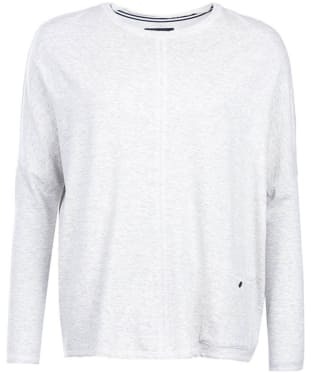 Crafted from 100% cotton, this naturally breathable sweater features a slub effect for added style, and an oversized pocket to the wearer's left hip. This relaxed fit Barbour International sweater features long fitted sleeves and a Barbour International branding badge to the back. 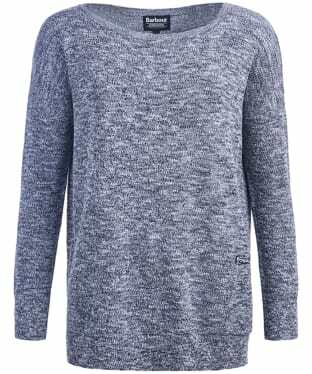 This loose-fitting Barbour International Arlen Sweater is a soft and flexible jumper with relaxed drop shoulders for a laid back look this season. The elegant round neck sweeps around the vertical stitching detail to the torso, where you'll also find a convenient patch pocket and Barbour International branded stud, to match those on the cuffs. Crafted from a super soft mix of viscose and elastane, this versatile sweater is finished with a brushed interior for added comfort. 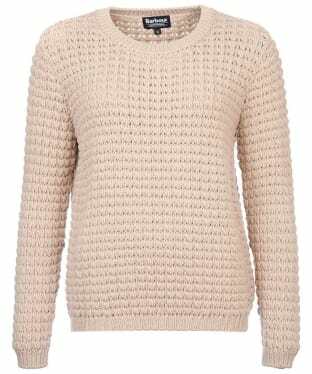 Featured in a gorgeous feminine hue, the women's Barbour International Fandor Textured Knit Sweater will bring a luxurious edge to your knitwear collection - especially during the warmer months. 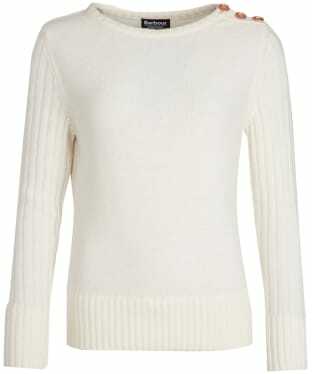 Crafted from a stunning merino and cashmere knitted blend, this jumper feels like pure luxury - made in a lightweight handle for easy year-round wear. 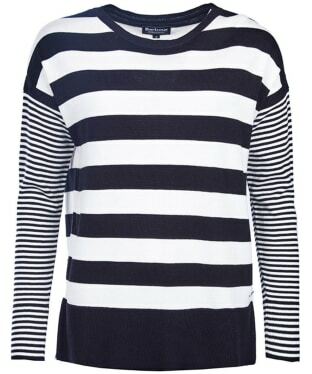 3/4 length sleeves make for a convenient and practical wear, whilst a knit detail around the neck and armholes in addition to a twisted side seam to add premium touches to this beautiful piece. Perfect for today's modern woman that doesn't want to compromise on signature luxury, the Fandor sweater boasts a zip fasten back and an all over fine mesh knit. Simply team with neutral jeans, chinos or shorts for a stunning addition to your wardrobe. 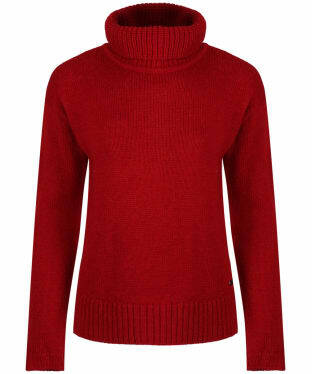 The women's Barbour International Delter Knitted Sweater is a gorgeous and sophisticated item of knitwear, perfect for wearing all year round. Crafted from a beautifully soft merino and cashmere blended fabric, it feels wonderfully luxurious and superbly comfortable to wear - enhanced by a stretch element for the perfect fit. A v neckline is extremely flattering, leading down to long sleeves and the signature Barbour International branding to the hemline. 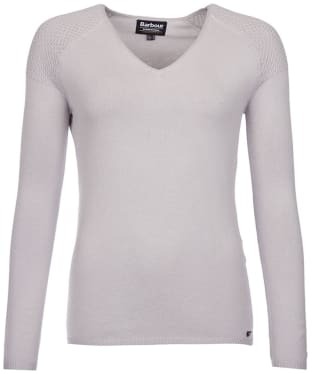 The soft stretch knitted blend boasts a mesh construction to the shoulders for that added dose of detail and inspired design. Keep your look simple and elegant by teaming with jeans, skirts or smart chinos. The Women's Barbour International Worldcrosser Knit Sweater is crafted in a luxurious blend of yarns and knitted with an open, lofty texture. It's styled with a fashionable oversized shape and raglan sleeves, and is detailed with biker-inspired exposed zips and a subtle Barbour International stud. 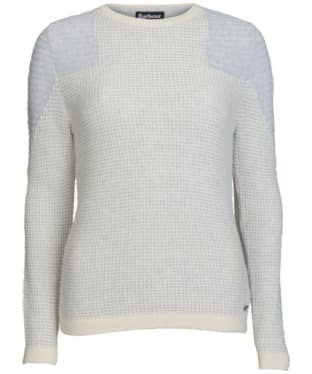 The women's Barbour International Chicara crew neck sweater is knitwear at its finest. Expertly crafted with a unique diamond tuck stitch knit pattern that exudes luxury, it has been crafted in a loose relaxed shape that flatters almost any silhouette. Long roll back sleeves add to the laid back feel, whilst the subtle size zip is a luxurious finishing touch. The beauty of this sweater is the two colour plated effect created by the intricate knit that has been carefully thought out to add luxurious depth to this look, making it suitable for both daytime and evening wear. Cream trims contrast this pattern beautifully, finishing it off with pure luxury. For a style that will keep you feeling comfortable and cosy whilst also creating a super stylish appearance, look no further than Barbour International's Chicara Crew Neck Sweater. A luxurious knit with a contemporary flavour, the women's Barbour International Fireblade Crew Neck Sweater will soon become your day to day for favourite for a superbly comfortable wear with a premium edge. With a gorgeously soft merino blend fabric, this sweater feels as good to wear is it looks - featuring a waffle detail weave with a stretch component for the ultimate wear. A two colour detail to the body and shoulders is a modern detail, complementing the flattering crew cut neckline and long sleeves. 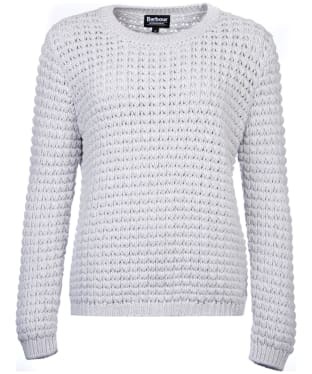 A soft hair detail to the textile creates a soft knit appearance that looks effortlessly luxurious. Simply team with denim, trousers or a skirt for an exceptionally versatile piece that can go from day to night effortlessly.